The concept of a “North Star” metric has become a fashionable discussion among start-up culture. The idea is that companies should find a single, simple metric to focus on and, if they choose well, it will align everyone on the team with the actions needed for success. Check out this deck on that topic from Sean Ellis, who popularized the “growth hacking” phenomenon. Call centers are highly focused on metrics too. 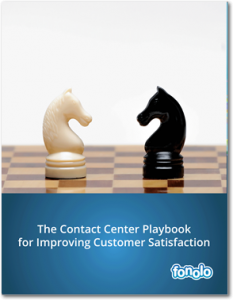 If most call center teams had to pick a “North Star” it would be service level, which measures the length of time callers wait to reach an agent. It’s kind of surprising that, despite all the enormous changes that have occurred in customer service technology, the dominant metric remains service level. Even more surprising is that most call centers would name the same target value for that metric: the magical “80/20”. Why is this so? Service level is always given as a pair of numbers: a percentage value and a time value in seconds. 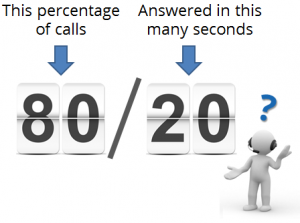 An “80/20″ service level means 80% of calls answered in 20 seconds. That exact combination is considered by many to be an industry standard. Many people assume this standard is based on careful analysis which revealed that 80/20 was a good target to set, but in reality, it appears 80/20 was arbitrarily chosen in the early days of call center technology. The original logic behind it is lost in the mist of time. (See Why 80/20 is Probably the Wrong Service Level for your Call Center.) Despite this murky origin, it has served as a focal point for call center teams. There is some value in the fact that it’s a common goal that everyone across the industry understands. So when colleagues are discussing service levels at an industry event (say, the excellent ICMI Call Center DEMO conference this month, which Fonolo will be attending) they can properly compare notes and trends. The very nature of the service level metric means that variability can get swept “under the rug”. Let’s say your call center successfully met your 80/20 target all day. So you know that 80% of the calls were answered in less than 20 seconds, but what you don’t know is how bad the other 20% were. Were their wait times 30 seconds or 10 minutes? This variability is critical. 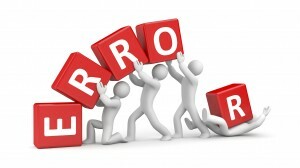 If you have multiple skill groups in your call center, another issue arises. Averaging across the groups to get a single service level can obscure problems in specific groups. Measuring each group separately is smarter, but that leaves you with too many numbers to interpret. This is actually an argument against dividing your workforce in to skill groups. Can you map Abandonment Rate to customer satisfaction or lost revenue? How are You Handling Service Level in Your Contact Center?